A Brief Inquiry Into Online Relationships ends up being a middling mess of genre-hopping. The 1975 decided to try a bit of everything and the results are just completely scattershot songs. The 1975's third album, A Brief Inquiry Into Online Relationships, hit back in December 2018, just as we here at PopMatters were immersed in our wide variety of end of the year music lists. So we're circling back to what, almost by default, is one of the biggest rock acts in popular music right now. And a Brief Inquiry is big as well. In an era when most albums arrive in a streaming-friendly running time of 45 minutes or less, this record contains 15 tracks and lasts a full hour. And it's fascinating. The 1975 are trying a lot of different things on this album, channeling everything from 1980s synthpop to 1950s jazz ballads. What it isn't is consistently good. The band's reach exceeds their grasp here, and vocalist/band leader Matt Healy's indulgences are often more tiresome than charming. A Brief Inquiry isn't all bad either, though. There are some genuinely enjoyable songs, but not enough to elevate the record to anything above middling. The album opens with the band's traditional theme song, here cast as a piano and multi-layered electronic vocal ballad. "Piano", "electronic vocals", and "ballad" are all portents of what's to come, it turns out, so I guess it sets the scene for the record admirably before sliding into "Give Yourself a Try", the first proper song. This starts as a catchy, upbeat pop-rock track before quickly curdling into aural punishment. The simple guitar riff that opens the song uses a screechy, slightly fuzzed-out tone that is effectively attention-grabbing. Once it has your attention, thought, it doesn't let it go because this four-second riff repeats nonstop for two and a half minutes, takes 15 seconds off, and then goes for another 30 seconds to finish the song. Healy's lyrics are essentially random advice, giving the wisdom of a 29-year-old to a younger person, but the lyrics don't really matter because the song is just. That. Riff. That riff could've been employed judiciously as one of several elements of "Give Yourself a Try" and it would have been a catchy little bit. But the way it's used it's like the 1975 found the riff and let Healy do some lyrics and then never came up with a finished version of the song. This happens in a couple of other places on the album as well. "Inside Your Mind" is a great big slow power ballad with huge, open major key piano chords and a simple, soaring guitar line. It's basically an early '80s rock ballad in the style of Journey or REO Speedwagon. Except it's nearly four minutes of buildup with no release. The drums and bass never kick in, the song never explodes into a big finish, and the lyrics never reach a climax. 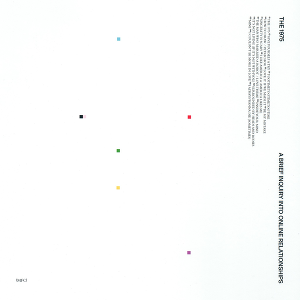 A case can be made that the 1975 are intentionally subverting expectations, but with only buildup, the song ends up feeling unfinished and unsatisfying. "I Like America and America Likes Me" seems to have a lot to say, with short phrases obliquely taking on all sorts of social issues. But musically the song is inert, just a bed of synth chords and synth drums creeping along under Healy's heavily vocodered vocals. It's like Healy thought that his snippets of statements were so important that they didn't need an actual song to buttress them. Speaking of self-importance, "America" is followed by "The Man Who Married a Robot/Love Theme". Ostensibly this is a cautionary tale about a man who spent his whole existence online, inspired by a moment when Healy had Siri read him back some of his own lyrics he had written down on his phone. So there is an electronic voice reciting the story, and the story isn't very good or interesting, despite Healy getting off a decent quip or two within the large wall of text. On a practical level, though, the song is a tiresome 2018 retread of Radiohead's "Fitter Happier", also known as "oh, that kind of weird transition piece on OK Computer that is a bunch of intentionally dubious advice read by a robot voice". More strangely, "Robot" is followed by 80 seconds of shimmering piano and orchestra chords and flutters that aren't particularly interesting musically, which makes the whole song a two-part composition in which each part is bad in completely different ways. "Love Theme" isn't even the only poor use of an orchestra on the album! There's "How to Draw/Petrichor", which also shimmers completely inertly for 90 seconds before Healy, his voice once again slathered in electronics, comes in, very gradually singing lines for another minute while the music just sits there shimmering. Then the electronic sounds take over as "Petrichor" mostly turns out to be a blatant rip off of the programmed drumbeat from the Postal Service's "The District Sleeps Alone Tonight" with other swatches of electronic noise flitting in and out. Healy eventually shows back up using a completely different electronic filter on his voice to sing a few more lines before the song fades away with a few sparse piano chords. It's a real mess. Fortunately, there are times on A Brief Inquiry when the 1975 isn't just playing around with orchestral strings and electronics and focus on songwriting. First single "TOOTIMETOOTIMETOOTIME" is a totally fun synthpop song, where the squiggly, catchy synth riff is used intermittently and Healy's vocal melody is interesting (and only subtly assisted by electronic vocal filters). "Be My Mistake" is an ode to loneliness, bad choices, and unfaithfulness played as a romantic acoustic ballad. As track six, it's the first time the album really slows down, but it is far from the last. Following that is "Sincerity Is Scary", a jazzy ballad with loungey piano, intentionally scattered trumpets, a backing choir, and a drumbeat that doesn't quite stay steady. It's a really odd sound for the band, but this is their most successful experiment on the album. But we can't talk about the 1975 without mentioning their '80s fetishism. The single "Love It If We Made It" mostly succeeds at this due to its soaring chorus. Healy belting out "I'd love it if we made it" goes a long way in this song, but the flat, '80s-style drums and the weird harp glissando also help. "It's Not Living (If It's Not With You)" is such a dead-on '80s synth-rock track that it suffers in comparison to actual '80s hits like Simple Minds' "Don't You (Forget About Me)." It's a decent bit of songwriting, but the '80s hits it apes are still so ubiquitously played that it doesn't feel fresh or interesting. Then there's "I Couldn't Be More in Love", which comes smack in the middle of the album's deadly final third. For some reason, Healy and company decided to close out A Brief Inquiry with four straight ballads. To be fair, each of these ballads comes in a different flavor, but it absolutely kills any momentum the record had and makes it a slow dirge to the end. "I Couldn't Be More in Love" is the third of these ballads and it features the band attempting to reclaim the much-derided '80s synthpop vocal ballad. But Matt Healy, as a vocalist, is not Michael Bolton or even Richard Marx. So the result is an excellent imitation of that type of song, right down to the synth tones, that is equally as cheesy and not sung nearly as well. Also in this run is "Surrounded by Heads and Bodies", which is acoustic guitar based and not as interesting as its title implies. The closer "I Always Wanna Die (Sometimes)", is a quiet-to-loud power ballad that is non-specific enough that it could have been recorded anytime from 1995 to the present and is a reasonably solid croon-along. Healy's falsetto is used to good effect here and the string section that accompanies the song at least has some forward motion to it. The most left-field track on the album is the second of the ballads, "Mine", which is a '50s-styled jazz-pop vocal track of the type made famous by Frank Sinatra, Tony Bennett, and Mel Torme. It's weird. Not the song itself, which is a pedestrian take on the form, with barely-there brushed drums, piano tinkles, sweeping violins, and soft trumpet fills. But Healy is once again taking on a style of music historically defined by its vocalists, and while he's a fine singer for pop-rock, he does not have the kind of top-notch voice necessary to pull off a straight-ahead version of the style. A Brief Inquiry Into Online Relationships ends up being a middling mess of genre-hopping. The 1975 aren't just content to filter their music through the '80s, which is a period they know their way around. Here they've decided to try a bit of everything, and the results are just completely scattershot songs. It makes for an interesting listen, but they're throwing everything they can at the listener, and most of it just doesn't stick. I have to wonder, too, with another album on the way in the first half of 2019, if the band isn't just rushing to finish as many tracks as they can without worrying too much about quality control. Even as only the first half of a delayed double album, A Brief Inquiry already feels like a classically bloated example of the form.